← Back to the Future … ? Sequestration. It’s a big word that most people have never heard before. Constant repetition in the media doesn’t help explain or define it, and the implications of what is pending (barring a last minute deal) are brutal. The word “sequester” means to “set apart”. In this case, $108B per year is planned to automatically be set aside from the US Budget, half from the military and half from other discretionary programs (that is, not including Medicade and other entitlements). This is not a sequestration, it is a meat axe to the budget. Assuming there isn’t a plan to stop this at the last minute, either by delaying it or passing a real budget for the first time in four years, what we have is the axe. You’re probably tired of hearing about it by now, but the use of words is important. The lack of a clear, common talk shows just what this is all about – an inside game that has to stop. How do we get past it? There are many plans in place to avoid sequestration. Each side has its proposals and has formed them into bills for consideration. There is also the Simpson-Bowles master framework, which is constantly gaining public attention. What remains a problem, however, is that this is an inside game made unnecessarily complex by personalities and interests. The need for “spin” shows how each side wants to protect their inside position rather than open it up for public scrutiny – the one thing that could get us past this mess. You may or may not agree with him that these are the critical issues, but there is little doubt that these are among the issues that Congress has to grapple with. Here Simpson tells his side of the story in plain English that everyone can understand – and be a part of the discussion. 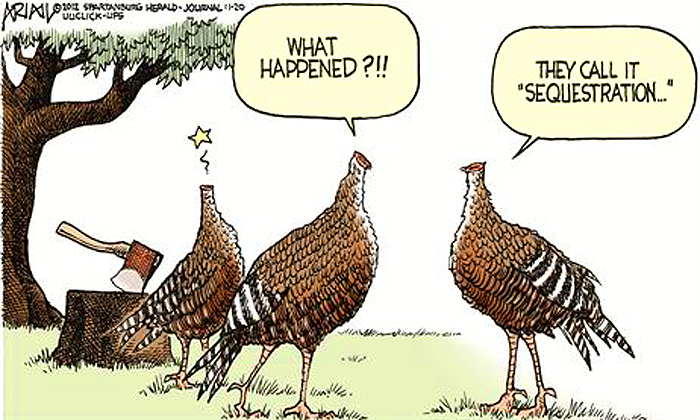 Sequestration? A fancy word that doesn’t advance the debate one bit. It neither advances nor adequately describes what’s at stake. As Janet Yellen, the vice chairwoman of the Federal Reserve, recently emphasized, one main reason for the sluggish recovery is that government spending has been far weaker in this business cycle than in the past. We should be spending more, not less, until we’re close to full employment; the sequester is exactly what the doctor didn’t order. Sure there are some big words in there, but “business cycle” at least has a rich meaning. We can all drone on and on about what we need from Washingtoon these daze – leadership, commitment, and patriotism come to mind. What I’d like more than anything is some cold, clear plain talk that engages the public. Spin designed to maintain the isolation only serves vested interests and petty personal disputes. There are two distinct uses for language – communication and identity. How you speak and the words you use are often as important as what you say because it tells the world what tribe you belong to. The supposed leaders often use words that describe which side they are on in the debate, but overall their identity is sealed by their inability to use plain talk to describe what is going on. They don’t belong to the people, they belong to Washingtoon. That’s the “sequestration” we have to put an end to. This entry was posted in Nooze and tagged congress, leadership, sequestration, simpson-bowles. Bookmark the permalink. I think we have the government we deserve. If we put up with this garbage its our own fault.